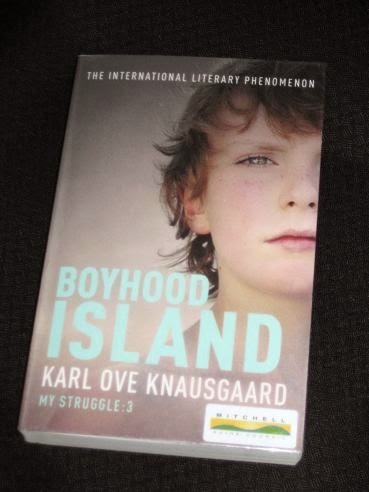 Boyhood Island (translated by Don Bartlett) is the third in the series of Knausgaard’s six My Struggle tomes, the latest to make it into English so far. The book starts off with his parents’ move to the small island of Tromøy, with little baby Karl Ove in tow. What follows in the next 490 pages is the story of a boy growing up, with the book ending (for now) with his departure from the island at the age of twelve. Much of the story follows young Knausi as he roams free through the landscape of both Tromøy and his youth. He runs wild, spending sunny days in the fields and at sea, enjoying a free-range, sepia-tinted childhood, with football, sweets, music and girls as his main distractions. It’s a wonderful life, but there is one, inescapable, shadow hanging over his otherwise perfect days – his father…. There’s a lot more to Boyhood Island than that, though. The simple tone is deliberate, with Knausgaard’s style mirroring the simplicity of the child’s thoughts, the adult writer keeping out of the child’s head as much as possible. In fact, as the story progresses, and Karl Ove grows up, the style does gradually become a little more complex, and it’s a wonderful description of a boy emerging from childhood. As he grows up, Karl Ove becomes more self aware, getting over many of his earlier behaviours. He also gradually realises his flaws, or at least the character traits which are seen as such by his classmates at school. To an outsider, he’s a geeky, bookish, slightly effeminate cry-baby. Still, it takes him a while to realise why he’s not really as popular as he’d thought (and hoped). “That was everything. That was the world. He bent down and scattered the logs with his big hands. I watched him with tears in my eyes. It’s an amazing, sobering picture of the helplessness of a child in the face of adult antagonism, one for all parents to think very closely about. While it may seem like a harmless release of frustration, it’s actually a highly damaging attack on a fragile soul. It might not be quite as good as the first two in the series, but Boyhood Island is a book that definitely grew on me. While initially fun, but a little plain, the dark side of the story involving Karl Ove’s father saves it from being a dull read. Again, though, as was the case with A Man in Love, I’d have to wonder whether it’s a boy thing: will women connect with his childhood as much? Part of the beauty of the series so far is how much the books speak to me, but do they speak to everyone? Will Karl Ove’s clumsy, distant views of girls ring as true with female readers as they do with men? I am nearly finished Boyhood Island, and it certainly resonates with me as a woman (slightly younger than “Knausi”). I also think it is better than A Man in Love. Anonymous – Glad to hear you like it 🙂 It definitely grew on me, but I'm sticking with 'A Man in Love' as my favourite so far.